diegetic. is an interactive installation of the triangulated gaze. Two large-scale queer portraits projected on the storefront windows of the gallery follow the movements of onlookers and passersby. 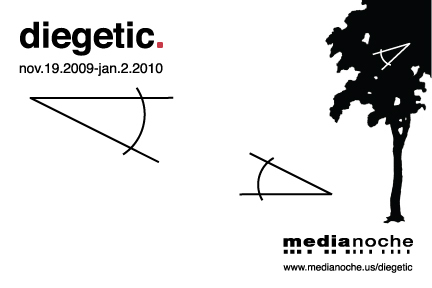 Watch the interaction over the web at www.medianoche.us/diegetic. From these perspectives, a multiplicity of narratives emerges calling into question subjectivity, power and truth. The interactive portraits are part of an ongoing project investigating queer bodies and gender representation. Each day a different portrait is projected on the gallery windows revealing, over time, an implicit narrative about the act of looking. According to Tavakolian: "At first it seems like a reversal of the gaze, where gender non-conforming portraits are returning the look. But as people pass by over the seven-week run, it turns more into a collective ownership of the act of looking. The addition of a webcam deflects the dichotomy of the subject/object and brings in an element of surveillance. It references the constant eye that is on us but also acts as a witness to the story." My work is mostly about disjointed identity. As a queer, Iranian, anti-gendered artist, I try to subtly transgress the limits of how we see and offer new ways of reflecting on our surroundings through non-traditional communication strategies. Niknaz Tavakolian was born in Tehran, Iran and raised in the United States. She is an interactive, electronic artist who is also a filmmaker and youth media mentor. Niknaz holds M.F.A. in Visual Arts from York University, Toronto, Canada and a B.A. in Film and the Media Arts from Temple University, Philadelphia, PA.